Bungree is currently seeking a Full Time Aboriginal Transport Officer to join their Transport Program Team. Bungree’s transport provides services to our elderly, frailed aged, people with a disability and our most disadvantage community members living on the Central Coast. We provide transport to medical and health appointments, social outings, shopping trips, community events, out of area appointments to Sydney and Newcastle for medical and health professional appointments. 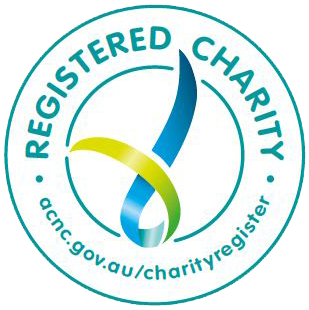 Demonstrated experience in working with elderly, frailed aged, people with a disability and disadvantaged community members. This is an identified position under Section 9A of the NSW Anti-Discrimination Act 1977. Applicants MUST obtain an employment pack, complete all relevant paperwork & address the selection criteria. Click here to download the employment package. Bungree is currently seeking a Full Time Aboriginal Employment Support Officer to support clients addressing and building on identified barriers to education, training, employment and to assist clients to achieve identified goals through case management. Thorough understanding of the Adult Education, Training and Employment sectors as they relate to Aboriginal people. Get ready to hit the greens! 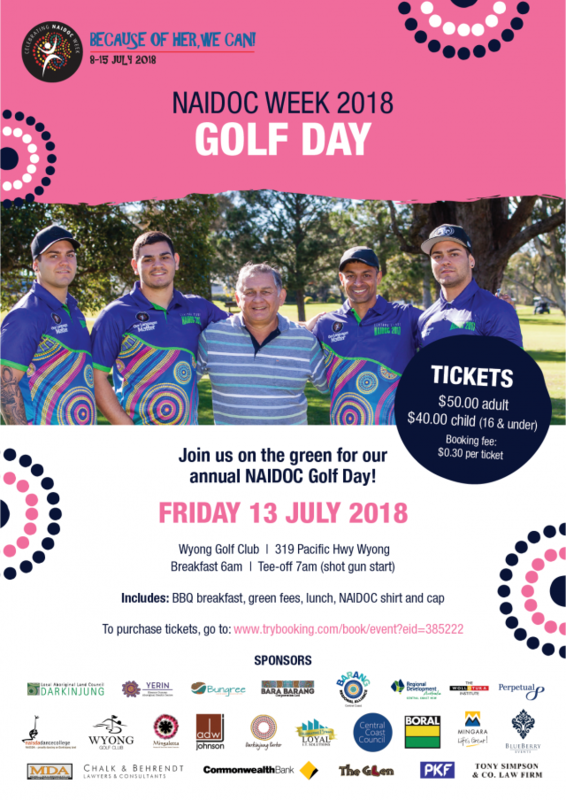 The Darkinjung Local Aboriginal Land Council NAIDOC Week 2018 Golf Day is taking place on Friday 13 July at Wyong Golf Club. To book your golf cart, please contact Darkinjung Local Aboriginal Land Council at darkinjung@dlalc.com.au or call (02) 4351 2930. Costs are additional to registration fees. Preference for carts will be given to Elders and members. 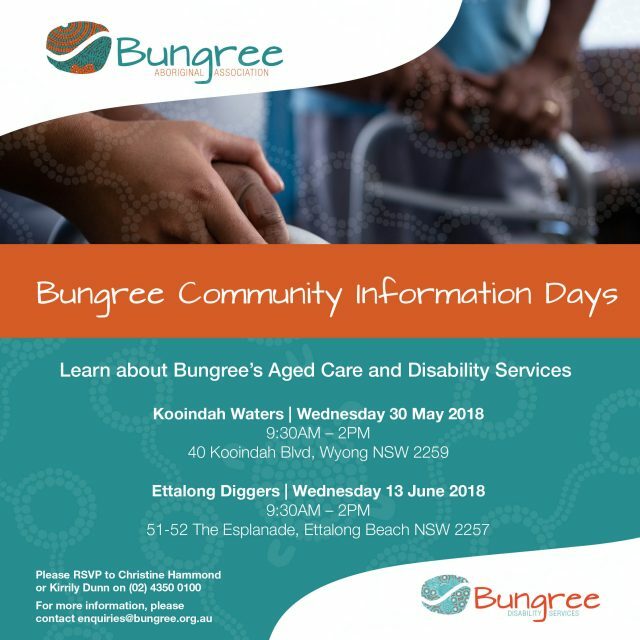 Come and learn about Bungree Aboriginal Association’s Aged Care and Disability Services at one of our upcoming Community Information Days. These half-day sessions will help to inform current clients, carers and community members of our programs and services such as My Age Care programs, NDIS and other Bungree services. Wednesday 13 June at Ettalong Diggers from 9.30am – 2pm. Morning tea and lunch will be provided at each venue. If you require transport, please contact Bungree on (02) 4350 0100 to make arrangements. Please RSVP to Christine Hammond or Kirrily Dunn on (02) 4350 0100. San Remo Neighbourhood Centre (The Epicentre) is seeking an Aboriginal Community Development Worker to lead a three-year community development project. The broad aim of the project is to promote cultural awareness across and within the local Aboriginal and non-Aboriginal community, people and organisations. To activate cultural spaces and build on existing strengths and networks within the local Aboriginal community. To encourage and support Aboriginal and non-Aboriginal people and services to learn, create and embed culture in our local community. This position will include planning, developing, coordinating, implementing and evaluating a range of community/social initiatives. The worker will be based at the Epicentre working in the Aboriginal Garden-Ngaliya Dhuluga’ which means, “you, I and we in the middle”. The Aboriginal Community Development Worker will be responsible for the provision of research, activities and programs that increase local Aboriginal identity that is proactive and has a strong and positive cultural voice which will be carried forward after the life of the project. Click to download the full position description. Applications close 28 May 2018.